We’re often asked what makes Transcranial Direct Current Stimulation (tDCS) different from some of the other brain stimulation techniques currently available. While there are numerous cranial stimulation technologies currently being studied within the scientific community, this page will focus solely on those technologies which are currently being practiced within the medical industry. 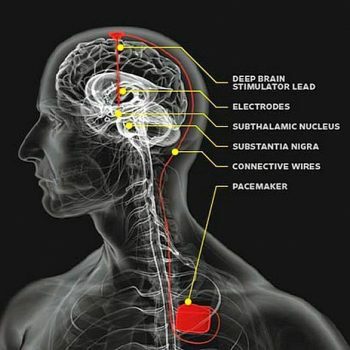 Additionally, we will also provide some comparisons between these technologies, and the rapidly growing cranial stimulation technique: Transcranial Direct Current Stimulation. Here we’re going to focus on three different types of brain stimulation currently being used in the medical field: Transcranial Magnetic Stimulation (TMS), Electroconvulsive Therapy (ECT), previously referred to as Electroshock Therapy, and the invasive stimulation method known as Deep Brain Stimulation (DBS). A Friendly Reminder: The Brain Stimulator, Inc. is not a medical company, and we do not provide medical products, services, or advice. The following is provided purely for informational purposes and should under no circumstances be considered medical advice. You should always consult with your health care professional regarding any medical related information. Transcranial Magnetic Stimulation is a non-invasive clinical treatment option, usually reserved for those suffering from severe treatment-resistant depression. Currently TMS is the most commonly practiced brain stimulation technique in the medical field. During treatment, patients are usually required to sit in a specially designed chair, with positioning frames that rest on the patient’s chin and forehead. These positioning frames are used to hold the patients head in place during treatment to prevent any undesired movement. Positioning frames are required for TMS therapy because the stimulation apparatus does not touch the individual’s head, but instead hovers just a few centimeters above the scalp. During Transcranial Magnetic Stimulation therapy, large magnetic coils are carefully positioning just above the patients scalp, directly over the desired stimulation area. Once the patient is ready, the Doctor or Researcher will turn on the TMS machine causing the magnetic coils to change polarity, producing short magnetic pulses. This can be thought of as similar to the act of turning a light switch on and then off again. When these tiny but powerful pulses reach the scalp, they produce an electric current in the nearby neurons located in the brain through a process known as electromagnetic induction. Repetitive Transcranial Magnetic Stimulation (rTMS) is an electromagnetic therapy similar to TMS. When reviewing the differences in TMS vs rTMS, the key difference lies in the word “repetitive”. 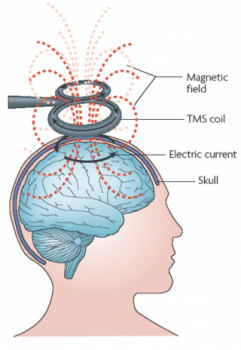 As described above, during TMS treatment the device’s magnetic coils switch polarity creating a steady electromagnetic pulse. In rTMS, the speed at which the magnetic coils change polarity is rapidly increased, usually switching between positive and negative polarities in just microseconds. This creates “repetitive” electromagnetic pulses, which in turn creates stronger electromagnetic induction. Due to the increase in strength, rTMS has the potential to solidify longer lasting changes in the brain, whereby TMS may only induce short-term changes. Du e to the way in which electromagnetic fields operate, the strength of TMS devices rapidly declines the farther away the machine is positioned from the scalp. Additionally, TMS can only penetrate just a few centimeters into the outer cortex of the brain. Therefore, if targeting deeper regions of the brain is desired, a more direct stimulation method such as tDCS may be used instead. Furthermore, because of the large size of the magnetic coils, targeting very specific areas of the brain is quite difficult. 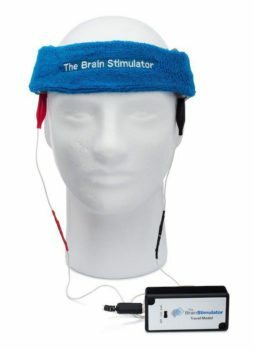 Alternative to the need to remain completely still during TMS, with tDCS the electrodes used to incite stimulation are secured directly against the scalp using a headband or positioning strap, which allows the individual to move about if they desire to do so. 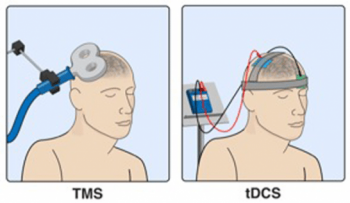 When targeting specific areas, tDCS is often used because of it’s ability to accommodate small electrodes, which can be placed directly on top of the desired stimulation area. Finally, TMS is only recommended within clinical settings due to the complex nature of the technology and the need for precise positioning. tDCS on the other hand can be used in research settings, with guidance from a technician, or even at home by the individual themselves, making it a far more desired option for personal brain stimulation. 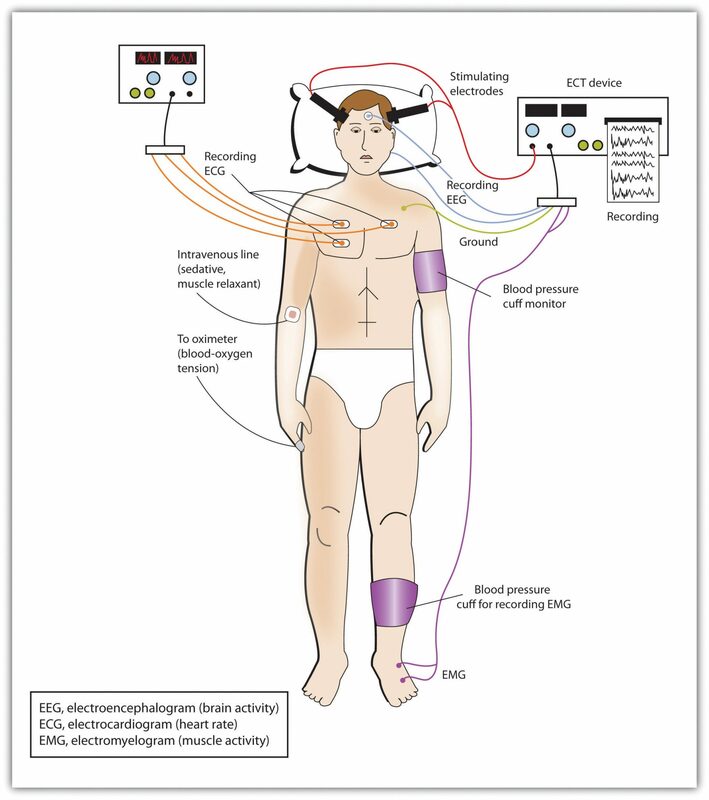 Like TMS, Electroconvulsive Therapy (previously known as electroshock therapy) is also a non-invasive brain stimulation technique, utilized in controlled clinical and research settings. ECT is reserved to treat only severe psychiatric illnesses which have proven resistant to other forms of treatment, and is usually considered as a “last resort” treatment option. 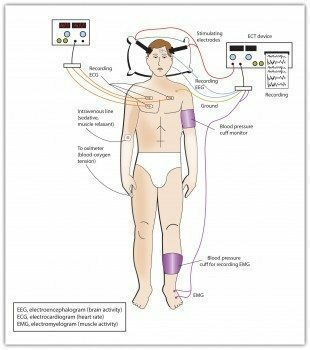 Unlike tDCS which utilizes a maximum current of 2 milliamps, ECT uses extremely high current levels (around 800 milliamps) which induces an intentional, controlled, short-term seizure. Due to the severity of the effects produced by Electroconvulsive Therapy, the patient is almost always sedated during stimulation, which lasts for an average of 1 to 6 seconds. The required use of sedation greatly increases the potential, and severity of any negative side effects. Prior to stimulation, machines used to monitor the patients vital signs are connected. Usually doctors or research physicians will monitor heart rate, blood pressure, brain waves (EEG), and blood oxygen levels to monitor for any undesirable results. Once everything is ready, the sedation medication will be administered to render the patient unconscious. Sedation is required to help keep the patient comfortable during the session, and also to reduce the chances of injury during the controlled seizures. In the past, Electroconvulsive Therapy was usually administered while the patient was awake. However, this process was eventually deemed inappropriate, and the level of current used was lowered and sedation techniques were introduced. Regardless of the changes in administration, ECT is still considered an extremely dangerous treatment option, and is usually not even considered until all other possible treatment options have been exhausted. Furthermore, some studies have reported that Electroconvulsive Therapy is only effective for 50% of individuals with treatment-resistant depression, and similar numbers were reported for those suffering from bipolar depression. According to a meta analysis conducted in June of 2014, ECT treatment appeared to be slightly more effective than rTMS treatment in those individuals suffering from psychotic depression. However, the same meta analysis also found that the reverse was true with those suffering with non-psychotic depression, where rTMS treatment was shown to be more effective. While it is true that ECT may be helpful in some patients, there is a rapidly growing movement of research and examination into tDCS’s potential to produce similar positive effects, without the associated risks present with ECT. Some researchers believe that certain tDCS montages (specific electrode placements) may have the possibility to help treat illnesses such as treatment resistant depression with a higher rate of success than ECT. Deep Brain Stimulation differs from all other brain stimulation techniques previously discussed, in that DBS is an invasive stimulation technique. Invasive brain stimulation involves a preliminary procedure to surgically implant parts of the stimulation device into the patients brain. During the procedure, the patient is fully sedated while the device’s electrodes are secured to the area of interest within the brain. Additionally, the wires connecting the electrodes to the device, and sometimes the device itself, is also implanted underneath the skin’s surface. Deep Brain Stimulation is currently used to treat severe neurological conditions such as Essential Tremor, Parkinson’s Disease, Tourettes Syndrome, and Dystonia. As with both TMS and ECT, DBS is considered a last resort treatment method, reserved only for those patients whom have undergone standard treatment options without seeing any benefits. Additionally, because DBS is still a relatively new technique, many candidates for deep brain stimulation are participants in clinical research trials. 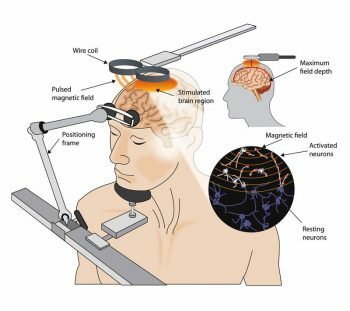 Due to the immense risks and invasive nature of DBS, many organizations such as Michael J. Fox’s Foundation for Parkinson’s Research are interested in the potential effectiveness for tDCS, as an alternative to DBS, for the treatment a variety of diseases and their symptoms, such as Parkinson’s Disease (learn more here). Transcranial Direct Current Stimulation is rapidly becoming a viable alternative for nearly all of the above mentioned stimulation techniques. due to its safety, portability, and affordability. In the past decade, research into the efficacy of tDCS treatment has exploded, with over 650 scientific studies on the topic having been published in 2016 alone. Research findings have shown that tDCS has the ability to assist with numerous debilitating illnesses such as depression, chronic pain, addiction, Schizophrenia, and epilepsy, and has even been shown to enhance cognitive abilities in healthy adults. During a normal treatment session, a tDCS device is used to apply a small amount of electrical direct current to the scalp via two electrodes; a positive “anode,” and negative “cathode”. The placement of the two electrodes on the scalp (referred to as the “montage“), is chosen based on the desired outcome of the stimulation session. For example, studies have shown that depression relief can be achieved by placing the positive anode electrode over the left dorsolateral prefrontal cortex (around the left temple), and the negative cathode over the right supraorbital region (just above the right eye). For example, numerous studies have shown that depression relief can be achieved by positioning the Anode electrode near the left temple, and the Cathode electrode just above the right eye. Alternatively, in studies where the Anode is placed above the right temple, and the Cathode above the left, subjects struggling with addiction and certain eating disorders reported a reduction in the frequency and severity of cravings. tDCS is currently the only brain stimulation technique that doesn’t require a physician prescription, and can be used in the privacy of one’s own home. Due to the simplicity of the technology, tDCS can be incredibly affordable. While the FDA has not yet approved tDCS for medical use, tDCS devices have been publicly available as experimental kits for nearly a decade. Interested in trying tDCS? Check out the various tDCS devices kits we have available in our online store! The contents of this website, such as text, graphics, images and other material are intended for informational and educational purposes only and should not be construed as medical advice. The contents of this website are not intended to substitute for professional medical advice, diagnosis or treatment. Although we work to keep the information on this site as up to date and accurate as possible, The Brain Stimulator, Inc. disclaims any warranty concerning its accuracy, timeliness and completeness of content, and any other warranty, express or implied, including warranties of merchantability or fitness for a particular purpose. The Brain Stimulator, Inc. assumes no duty to correct or update this website nor to resolve or clarify any inconsistent information. By accessing this website and viewing its content you agree to the acceptance of these terms.